Camping is a lot of fun and highly recommended. Hundreds of cachers take advantage of camping, resulting in a tent city. Feeling adventurous? 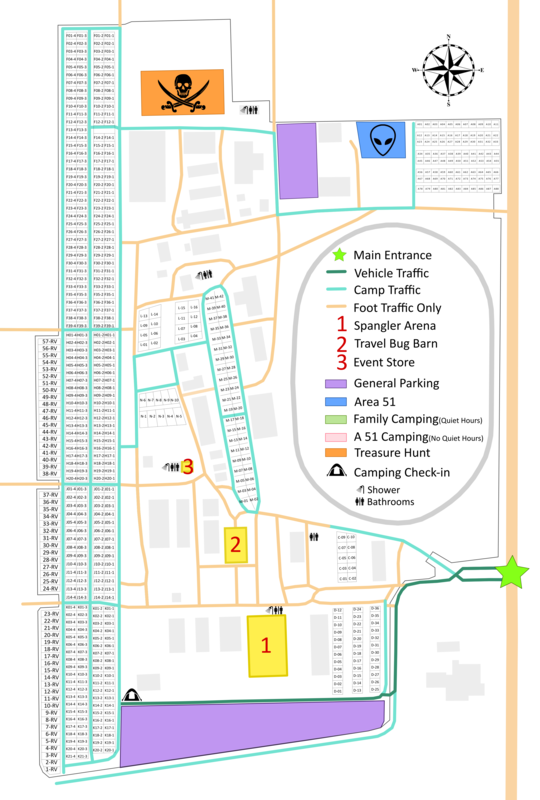 Book your site in the Area 51 camping! Don't forget - if you camp... make sure to participate in our campsite decoration contest. Last year we gave away 3 GPS units to the top decorators. We appreciate all attempts to decorate according to theme - it makes a huge difference in the event atmosphere! If you intend to decorate, you have permission to use any mascots, logos, etc. in your theme decoration. For more info regarding camping, check out the full list of camping and venue policies. If your style isn't camping out, there are a variety of hotels nearby - all about 1/4 mile from the grounds. A very short drive and a reasonable walk home if you need to. (trippy walked home each night last year and thought it was fine) The hotels span the spectrum of "fanciness" as well as cost. You will be able to easily find something that meets your needs and budget. This is a "Motel" style hotel, where all doors face the parking lot and your door is not in a hallway. Free wifi is provided. Closest hotel to MWGB grounds. Most expensive of nearby hotels, but has free wifi, a pool, workout center, and complimentary hot morning breakfast. When you are visiting Wauseon -- and you'd prefer an historic home to a small town motel -- we've got the place for you! Featuring a 98 room country inn with indoor pool and hot tub, and a 47 site campground with lake for fishing and use of the indoor pool at the Inn.